Punk's Jagger/Richards songwriting team is back together. Epitaph founder and renowned producer Brett Gurewitz has stepped out from behind his desk and recording board and re-grouped with partner in crime Greg Graffin, a reunion that neither thought would ever happen. After leaving Atlantic Records, the label that snatched Bad Religion from Epitaph (parting ways with both Gurewitz and Epitaph), Epitaph seemed like the only place to go, welcoming back the band that started it all to record their best album to date. Before they would record their best album, though, one more piece of the puzzle was needed. When Graffin and Gurewitz decided to write and record the next album as a team, their fate was sealed. Bad Religion, one of the founders of modern punk, would once again reign - Epitaph and the punk scene. 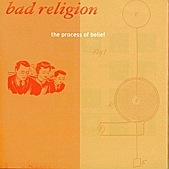 The Process of Belief is politically-charged, fast, non-stop punk rock much like you have come to expect from Bad Religion. However, much like Mick Jagger can write a good song on his own, without Richards, Jagger's attempts seem feeble and lackluster, no matter how great they are. The same is true for Bad Religion's post-Epitaph releases. Though good (and sometimes even great), the spark that made them an influence for so many was gone. When Gurewitz returned, the spark seemed to have never left. "Supersonic" is fueled by Graffin's political rant, well phrased and always outspoken, while Gurewiz guitar and songwriting structure takes Graffin's lyrics to the next level, pushing his words out like a firecracker, forcing you to listen to everything that is happening. The well-oiled machine that is Bad Religion is relentless in their attack. Offering up soon-to-be staple punk songs such as "Broken", a layered punk number combining the beauty of acoustic guitars with the fierce noise of electric, all while the hammering rhythm section blurs the line between pop and punk. "Kyoto Now!" and "Evangeline" are more standard Bad Religion numbers, while "Sorrow" and "Epiphany" find the band stretching out. "Sorrow" starts out with some white boy punk rock reggae before doing a 180 and launching into the punk. And "Epiphany" is a big chorus wrapped pop-rock verses, a radio hit that could take over modern rock radio and save it, but most likely won't. After being a band for nearly two decades, most bands just go through the motions, creating albums to preserve ego and fatten their wallets. Bad Religion, however, find new meanings to the words "friendship" and "band", re-grouping to create the year's best punk album and quite possibly one of the most anticipated albums of the year, punk or otherwise. I'll give it an A+. Bad Moon Music: Empire Bad Wizard: #1 Tonite!